The entrepreneur was fuming over the phone. He is arguably angry: he had heard of a company had just been raided on trumped up charges and I spoke to him one evening after he returned to the UK. “That’s the advantage. And it’s going to be so easy for China to shoot that one advantage away,” he said. Foxconn faces two problems in the 21st century: an image problem and an employment problem. Both issues are not easy fixes and, if things don’t change, these problems could spell the death of inexpensive manufacturing on the mainland. Foxconn’s primary problem, at least as many understand it, is the issue of image in the Western media. A small organization, Students and Scholars Against Corporate Misbehavior, prides itself at being the primary thorn in Foxconn’s paw. But even SACOM agrees that Foxconn is a target because it is so big. “Labor conditions are worse in small, home-based factories,” said Debby Chan, SACOM’s project officer. “But many brand name companies like Apple and Nokia have a code of conduct and they promise their products will be manufactured under legal standards.” By aiming at Goliath, the group hopes to point out abuses inside an ostensibly “good” manufacturer to force change in the smaller manufacturers. SACOM’s accusations are quite inflammatory. In interviews and plant investigations, the group found the workers are often told “If you cannot endure this kind of hardship then we have plenty of workers” and that “A majority of workers have to stand for 10 hours during work shifts.” Workers multiply these long days by six days a week (even longer during run-ups to large shipments) and often complain of leg cramps and exhaustion after work. “The managers can be psychotic,” said an exporter I spoke to. These outrages, seen in the light of their value of propaganda, point to a certain paternalism and, while I wouldn’t want to work 10 hours a day on an assembly line, it’s clear that many of the complaints are weak sauce. While “Water and electricity suspensions occur on regular basis in the dormitory” sounds bad, the related complaint (“There are unreasonable prohibitions against activities such as washing clothes or using hair dryers in the dormitory”) is a reaching a bit. Foxconn long made its money with secrecy and scale. They had the biggest lines in China, the most employees, and they could pump out thousands or millions of pieces in relative secrecy. By hiring Western-trained managers straight out of Silicon Valley central casting, the company has been able to work with the biggest names in hardware: Apple, Nokia, Cisco, Dell. Not bad for a firm that originally wanted to be the “best hardware connector company in the world” back in the 1970s. Now that scale is falling and the secrecy is hitting a wall, as evidenced by the many leaks that wind their way out of Shenzhen every day. The scale is also the major cause of many issues SACOM has with the company. If Foxconn didn’t have massive contracts that required thousands of employees to stand ten hours a day to manufacture phones, then those workers would be out of a job. The alternative – that Foxconn “clean up” – is to ignore the business cases that can be made for an efficient workforce trained and drilled in what amounts to a “Foxconn methodology.” Not everyone on the floor is an engineer, so the training must obviously aim at the lowest common denominator. Someone with a bit of initiative and education will chafe at sticking screws into a cellphone all day long. Someone who may have been destined to work the fields and farms of rural China may find it wildly enticing. The tragedy of American manufacturing is heart-breaking. Towns like Flint were decimated by a few strokes of a pen on a business plan. But does the son of a wheel-fitter at the old Chevy plant want to be a wheel-fitter, especially once the (relative) good life has been attained through the hard work of the unions? The same holds true of the various factory employees and managers I met in China. Even as we criticize, things change. The main street was little more than a truck stop—a sleepy row of cheap restaurants and auto repair shops that served people going somewhere else. That was all that remained of the local economy; the lure of southern factory jobs had defeated this place in a way the nomads never had. This exodus has an interesting side-effect. As I noted in my first post, Foxconn is facing a world of workers who want more. As one wag suggested in comments, the original Foxconn model, like the original Matrix, was too perfect. 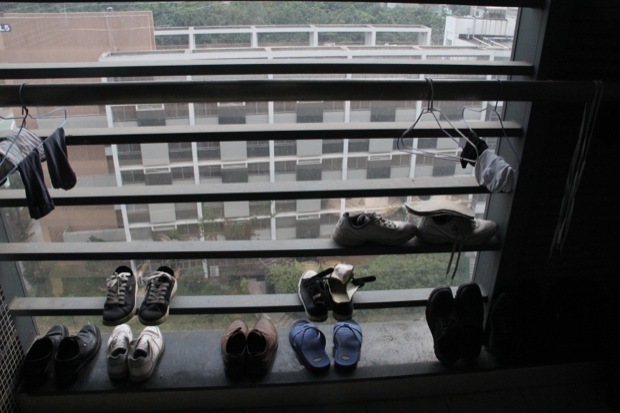 A dorm, three meals a day, and socializing on campus was, at best, insulting to modern Chinese. The introduction of freedom, however scant, will keep workers happy for only so long, however. “Workers are warned that they may be replaced by robots if they are not efficient enough,” said Chan in a SACOM report. Interestingly, this is truer than even the workers realize. As employees begin to look around and assess alternate forms of income, Foxconn has begun an impressive push into research and development. As one product designer in Shenzhen explained it, the days of selling a thousand pieces of knock-off junk for a profit are over. The real value in the Chinese manufacturing chain, he said, came from the design. Sure, it can contain all the same guts – the PCBs, the batteries – but the case, the UI, all of that is now of tantamount importance. “You can’t just buy a crate of tablets and make a profit. There’s no money in it,” he said. Foxconn’s Louis Woo noted that the company now has a database of materials and systems that it can easily address, using its vast wealth of manufacturing experience to build new products. “We can pick up some data and tell you if your product will work. We’ll say ‘We tried it last year, and this happened.’ That will save you a lot of time,” he said. Included in this is a reinvestment in robots. “I believe in the next two years we will be one of the largest automated manufacturers. We will definitely be one of the largest users of robots in the world. More testing, more examination, more R&D, more automation,” he said. This is part three of a four part series that will run this week about Foxconn. You can read the whole series here. Tomorrow: The Final Part Of This Series, Ten Thousand Horses Galloping.